$99.00 Out of stock. Email me when new stock arrives. Looking for a production display that keeps going and going? Tora Magic's Multiplying Dice will do this for you! Show two open, rectangular tubes. Lift one and there lies a ball. Lift the other and there lies a large die. Simply covering them with the tubes makes the two switch places. This can be repeated several times. Then you remove a die from one of the tubes, and it appears underneath it again. 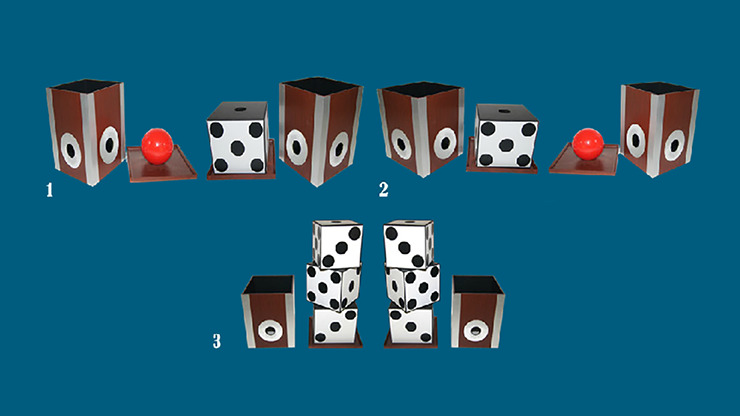 This is repeated with increasing suspense and excitement on each side until six dice appear. You finish with two stacks of dice and no ball! Wait until you see the faces of your audience at each phase. Treat them to Multiplying Dice!